Valentine’s Day is exactly one month away. 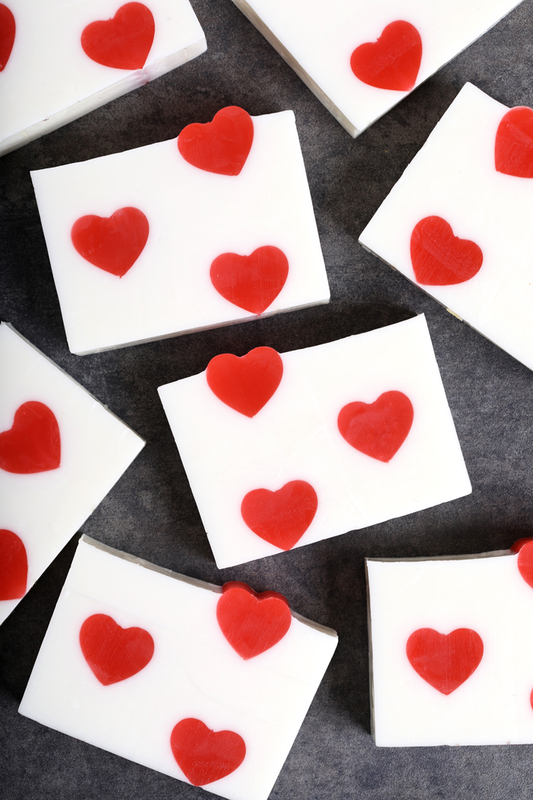 These Classic Heart Melt & Pour Soaps are the perfect way to spread love to the special people in your life. They’re ready in just a few hours, and one batch makes about 8-10 bars. They’re scented with Crisp Apple Rose Fragrance Oil. It’s one of our top-rated scents with more than 40 reviews and 5 stars. Once you’re ready to gift these bars, check out the tutorials below from Tania of Soapish and Linda O’Sullivan. Both came up with adorable packaging options that make your gift feel truly special. ONE: Chop 15 ounces of Clear Melt and Pour Soap Base into small, uniform pieces. Place them in a small heat-safe container along with a chunk of the Perfect Red Color Block. Melt in the microwave using 15 second bursts. Once melted, stir thoroughly to mix in the color. If the color isn’t saturated enough, add more small chunks of the Perfect Red Color Block. TWO: Place the Mini Heart Column Mold into a tall container to keep it upright. Pour the soap into the mold until filled, and set the rest of the red soap aside. Allow the soap in the mold to fully cool and harden. Remove the soap from the mold and trim off any imperfections. 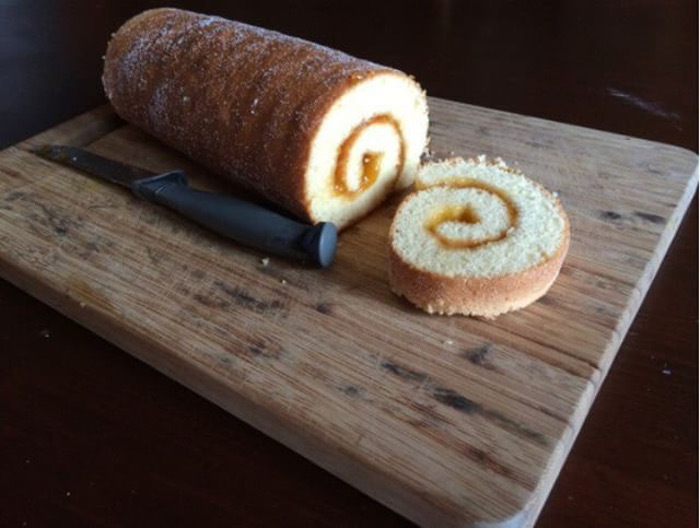 Cut the embed to a length that will fit inside the 10″ Silicone Loaf Mold. TIP: You can place the soap in the fridge to help speed up the cooling process. If you live in a humid area, this can increase the chance of glycerin dew. THREE: Remelt the red soap using 10 second bursts. Pour more of the soap into the Mini Heart Column Mold. Allow to fully cool and harden. Remove from the mold, trim any imperfections, and cut to a size that will fit inside the 10″ Silicone Loaf Mold. FOUR: Remelt the red soap using 10 second bursts. Pour the remaining red soap into the Mini Heart Column Mold and allow to harden. Unmold, trim any imperfections, and cut to a size that will fit inside the 10″ Silicone Loaf Mold. You now have 3 heart embeds – set them aside. FIVE: Chop 48 ounces of Goat Milk Melt and Pour Soap into small, uniform pieces. Place them in a large heat-safe bowl and melt in the microwave using 30-60 second bursts. SIX: Add 1.3 ounces of Crisp Apple Rose Fragrance Oil. Stir to thoroughly combine. 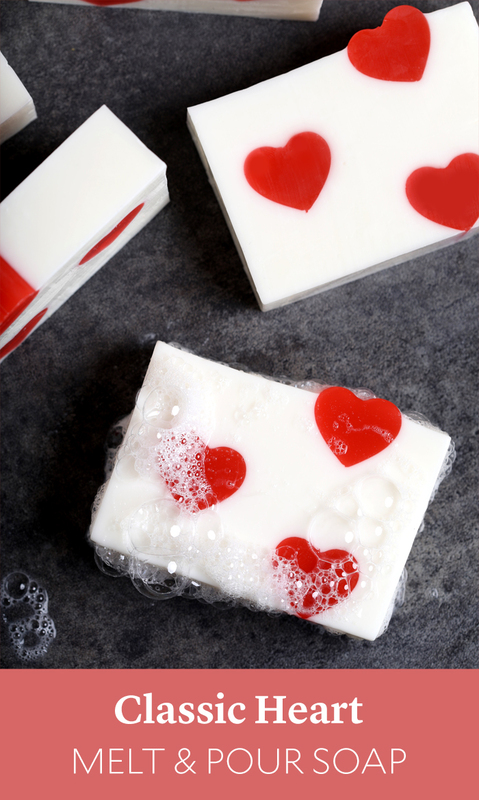 Allow the soap to cool to about 130°F – if the soap is too hot for the following steps, it can melt the heart embed. 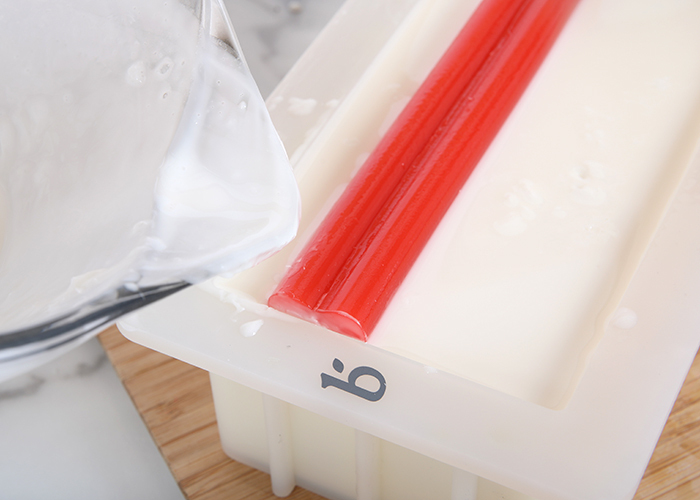 SEVEN: Pour enough white soap into the mold to completely cover the bottom – about 10 ounces. Spritz with 99% isopropyl alcohol to get rid of bubbles. EIGHT: Place one of the heart embeds into the soap toward one side of the mold. Hold the embed in place for several minutes until the white soap hardens enough to keep it steady. 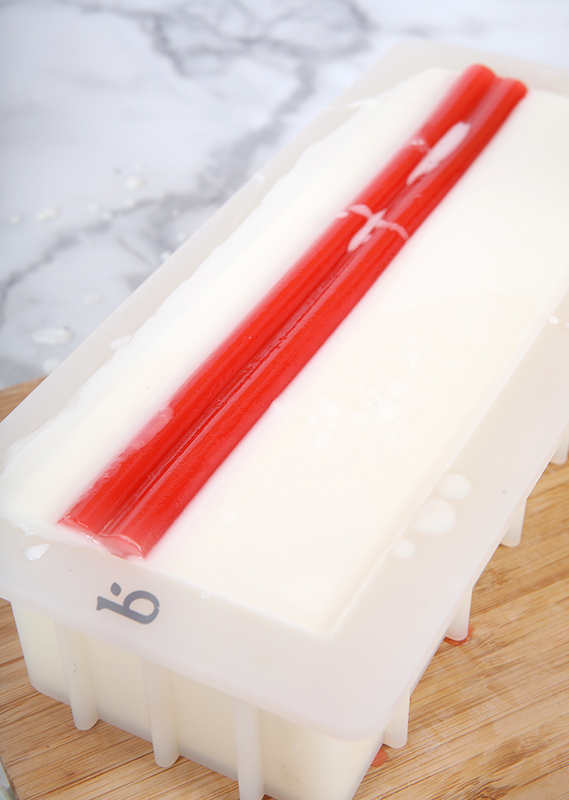 NINE: Spritz the soap in the mold with 99% isopropyl alcohol, then pour more white soap into the mold. Pour enough to completely cover the heart embed. Spritz with 99% isopropyl alcohol to get rid of bubbles. Allow to cool and harden for about 5-10 minutes. TEN: If necessary, remelt the white soap in the microwave using 10-15 second bursts. 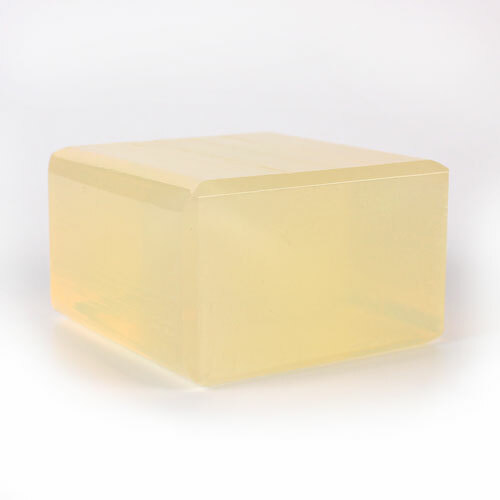 Once the soap is fluid but below 130°F, spritz the soap in the mold with 99% isopropyl alcohol. 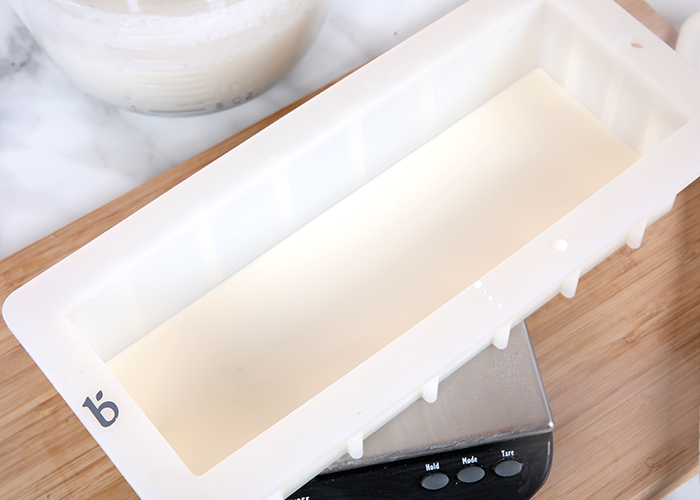 Pour a small amount of white soap into the mold – enough to completely cover the bottom embed. 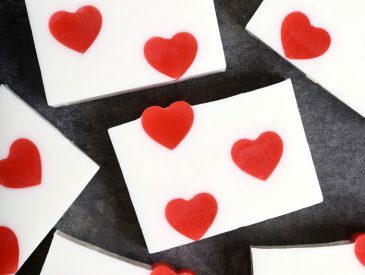 Place another heart embed into the soap on the opposite side of the mold from the first one. Hold the embed in place for several minutes until the white soap can hold on its own. ELEVEN: Spritz the soap again with 99% isopropyl alcohol and pour more white soap into the mold until the heart embed is covered. Spritz with 99% isopropyl alcohol to get rid of bubbles. Allow the soap to cool and harden for about 10-15 minutes. TWELVE: If necessary, remelt the remaining white soap using 10-15 second bursts. 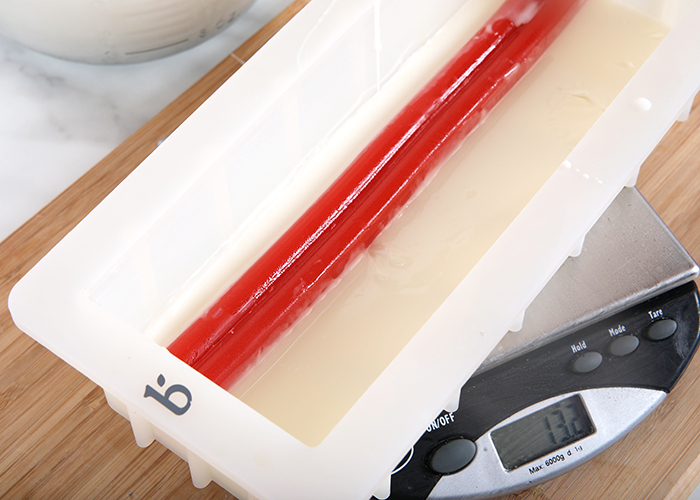 Once the soap is fluid but below 130°F, spritz the soap in the mold with 99% isopropyl alcohol. Pour a portion of the white soap into the mold and place the last embed into the soap on the opposite side of the mold as the second embed. Hold in place for several minutes until the soap cools and hardens enough to hold the embed on its own. THIRTEEN: Spritz again with 99% isopropyl alcohol and pour the remaining white soap into either sides of the embed. Try your best to make both sides level. Spritz with alcohol to get rid of bubbles. TIP: If you dribble a bit of white soap on the top embed, don’t fret. You can clean that off once the soap is hard with the Clean Up Tool. 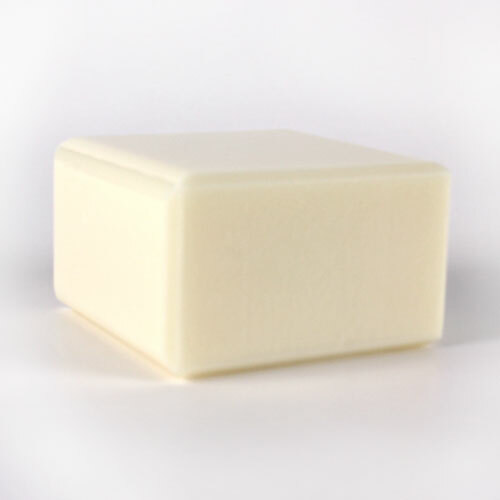 If you pour a little too much white soap into the mold (like we did) and it begins to flow outside the mold, this can also be cleaned up once the soap is cool and unmolded. FOURTEEN: Allow the soap to fully cool and harden. 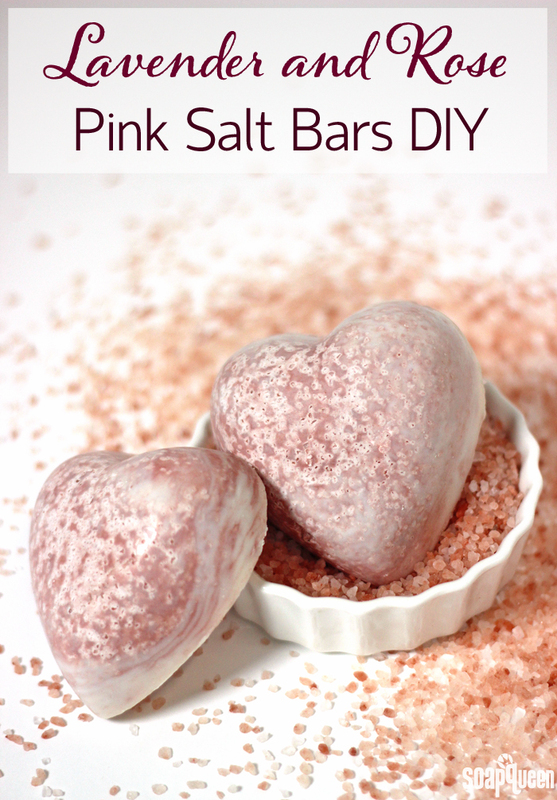 Remove from the mold and use a non-serrated knife to cut into bars. If you live in a very humid area, wrap the bars in plastic wrap to prevent glycerin dew. Enjoy! 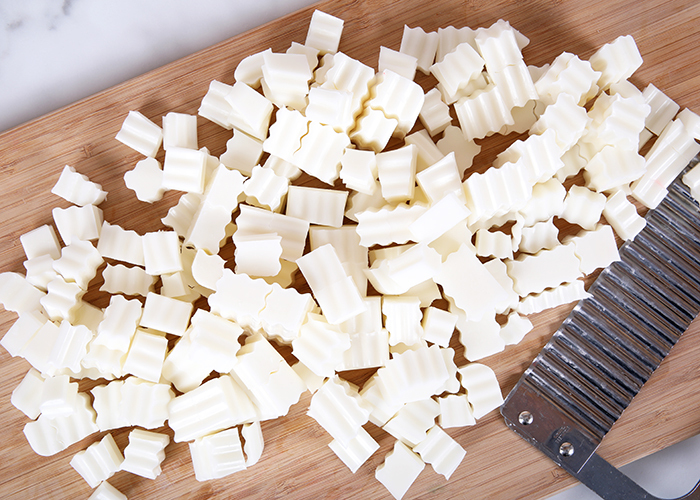 Chop 15 ounces of Clear Melt and Pour Soap Base into small, uniform pieces. Place them in a small heat-safe container along with a chunk of the Perfect Red Color Block. Melt in the microwave using 15 second bursts. Once melted, stir thoroughly to mix in the color. If the color isn’t saturated enough, add more small chunks of the Perfect Red Color Block. 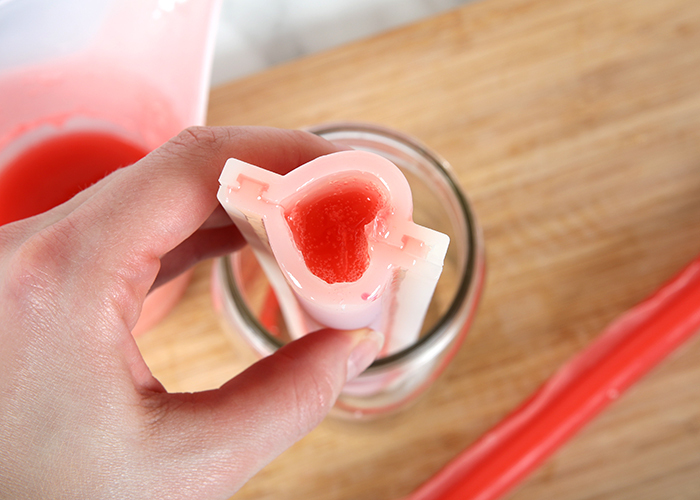 Place the Mini Heart Column Mold into a tall container to keep it upright. Pour the soap into the mold until filled, and set the rest of the red soap aside. Allow the soap in the mold to fully cool and harden. Remove the soap from the mold and trim off any imperfections. 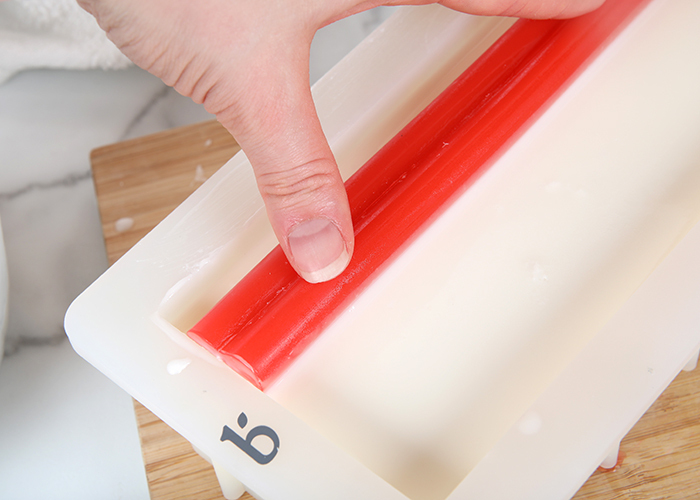 Cut the embed to a length that will fit inside the 10″ Silicone Loaf Mold. TIP: You can place the soap in the fridge to help speed up the cooling process. 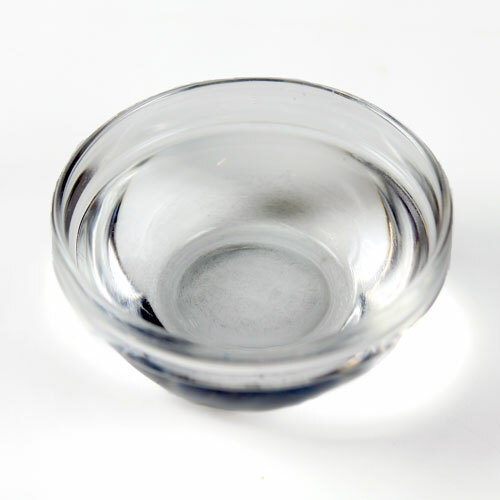 If you live in a humid area, this can increase the chance of glycerin dew. 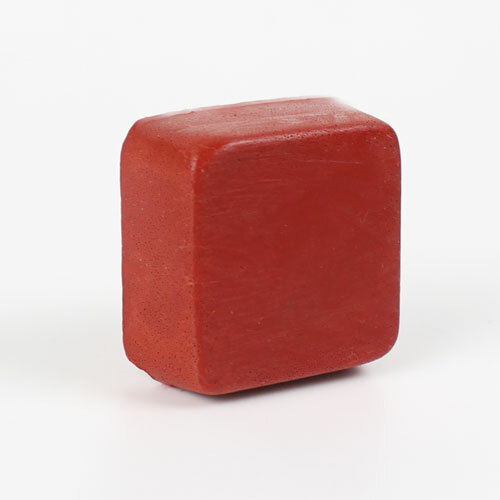 Remelt the red soap using 10 second bursts. Pour more of the soap into the Mini Heart Column Mold. Allow to fully cool and harden. Remove from the mold, trim any imperfections, and cut to a size that will fit inside the 10″ Silicone Loaf Mold. Remelt the red soap using 10 second bursts. Pour the remaining red soap into the Mini Heart Column Mold and allow to harden. Unmold, trim any imperfections, and cut to a size that will fit inside the 10″ Silicone Loaf Mold. You now have 3 heart embeds – set them aside. 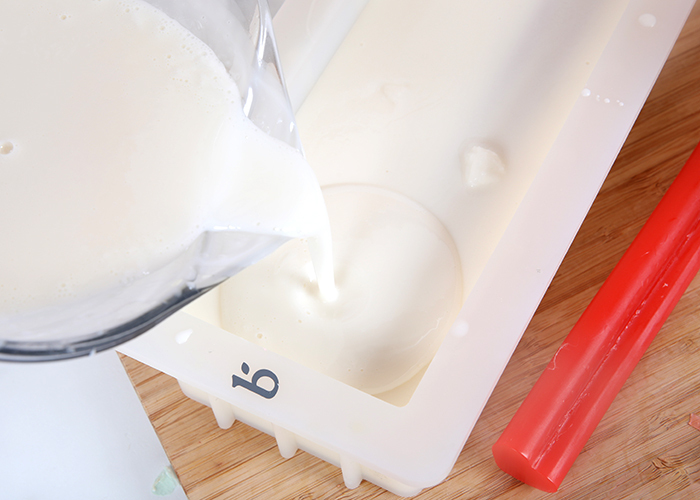 Chop 48 ounces of Goat Milk Melt and Pour Soap into small, uniform pieces. Place them in a large heat-safe bowl and melt in the microwave using 30-60 second bursts. 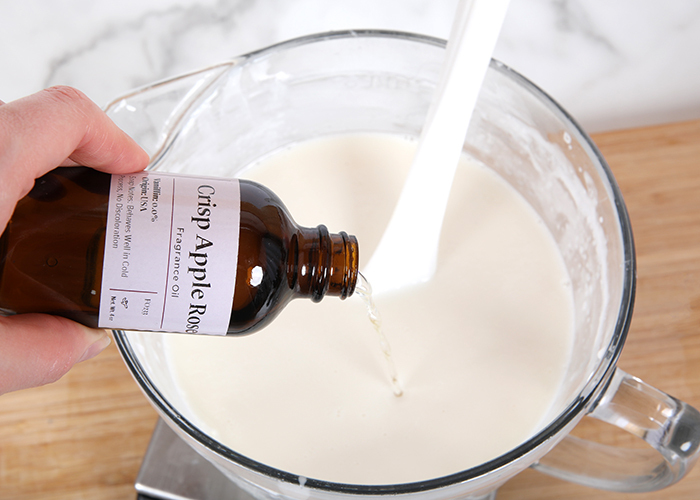 Add 1.3 ounces of Crisp Apple Rose Fragrance Oil. Stir to thoroughly combine. 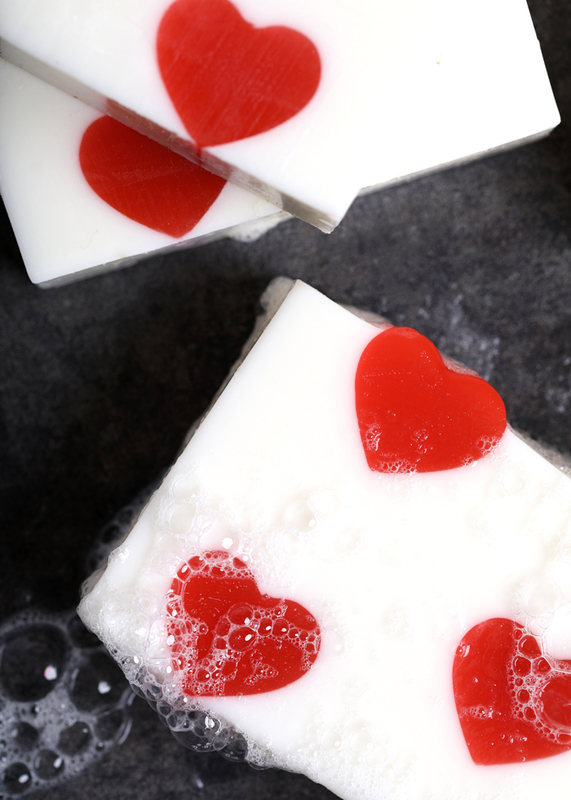 Allow the soap to cool to about 130°F – if the soap is too hot for the following steps, it can melt the heart embed. 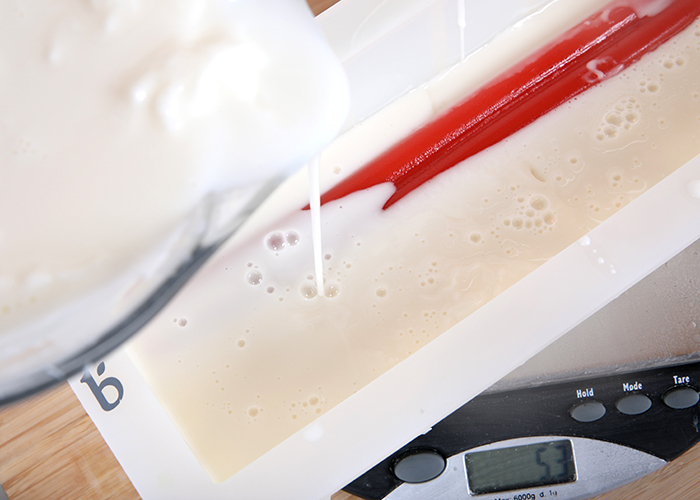 Pour enough white soap into the mold to completely cover the bottom – about 10 ounces. Spritz with 99% isopropyl alcohol to get rid of bubbles. Place one of the heart embeds into the soap toward one side of the mold. Hold the embed in place for several minutes until the white soap hardens enough to keep it steady. Spritz the soap in the mold with 99% isopropyl alcohol, then pour more white soap into the mold. Pour enough to completely cover the heart embed. Spritz with 99% isopropyl alcohol to get rid of bubbles. Allow to cool and harden for about 5-10 minutes. If necessary, remelt the white soap in the microwave using 10-15 second bursts. Once the soap is fluid but below 130°F, spritz the soap in the mold with 99% isopropyl alcohol. 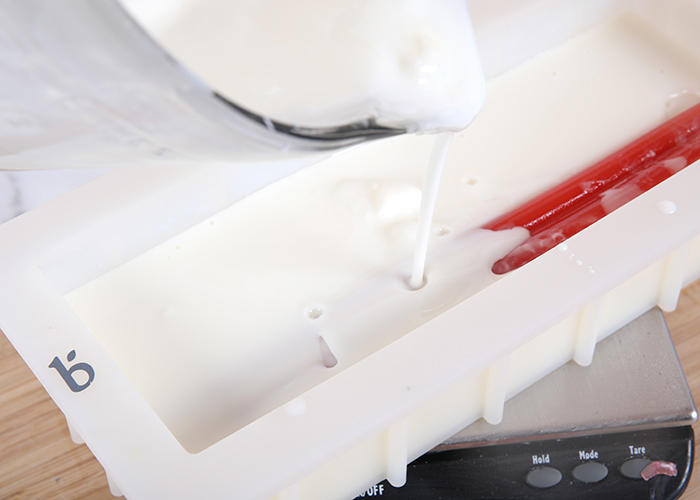 Pour a small amount of white soap into the mold – enough to completely cover the bottom embed. Place another heart embed into the soap on the opposite side of the mold from the first one. Hold the embed in place for several minutes until the white soap can hold on its own. Spritz the soap again with 99% isopropyl alcohol and pour more white soap into the mold until the heart embed is covered. Spritz with 99% isopropyl alcohol to get rid of bubbles. Allow the soap to cool and harden for about 10-15 minutes. If necessary, remelt the remaining white soap using 10-15 second bursts. Once the soap is fluid but below 130°F, spritz the soap in the mold with 99% isopropyl alcohol. Pour a portion of the white soap into the mold and place the last embed into the soap on the opposite side of the mold as the second embed. Hold in place for several minutes until the soap cools and hardens enough to hold the embed on its own. Spritz again with 99% isopropyl alcohol and pour the remaining white soap into either sides of the embed. Try your best to make both sides level. 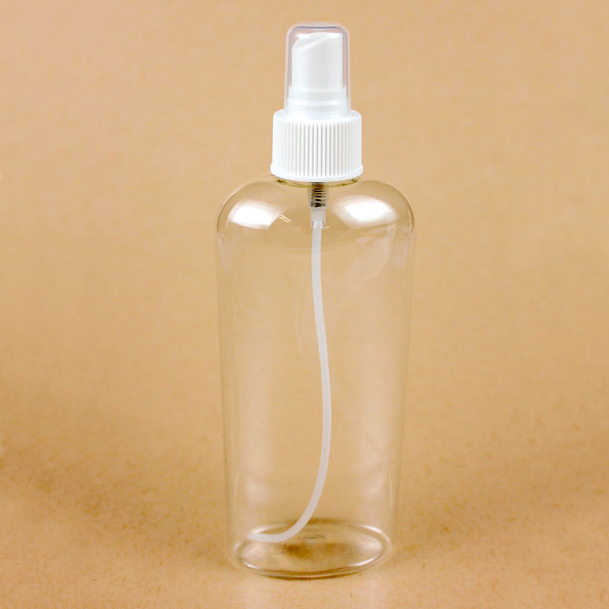 Spritz with alcohol to get rid of bubbles. TIP: If you dribble a bit of white soap on the top embed, don’t fret. You can clean that off once the soap is hard with the Clean Up Tool. If you pour a little too much white soap into the mold (like we did) and it begins to flow outside the mold, this can also be cleaned up once the soap is cool and unmolded. Allow the soap to fully cool and harden. Remove from the mold and use a non-serrated knife to cut into bars. If you live in a very humid area, wrap the bars in plastic wrap to prevent glycerin dew. Enjoy! Happy Valentine’s Day! There are so many ways to show people you care and they don’t have to be big and expensive. Sometimes the most meaningful gestures are small and handmade. 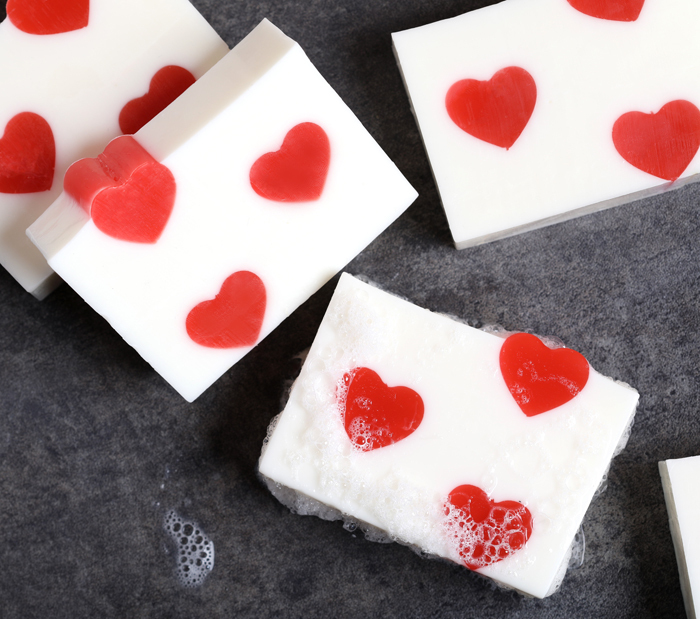 We asked members of the soapmaking community how they show their love. Find their answers below. 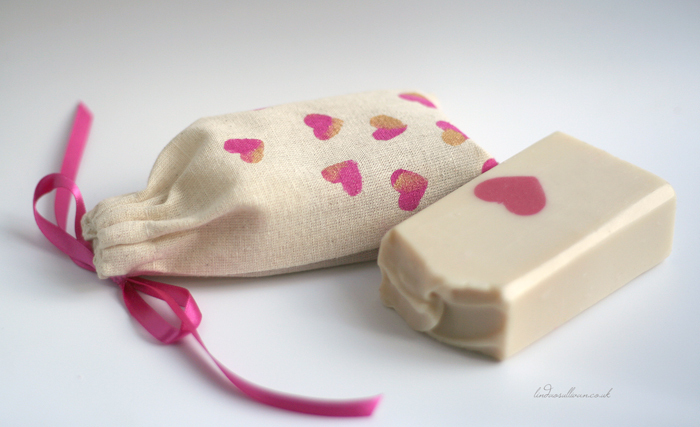 Kristina’s beautiful heart bars scented with Red Apple Fragrance Oil. My family and I enjoy celebrating Valentine’s Day, but without all the expensive commercial gifts. I personally choose to see Valentine’s Day as a day to really celebrate love and the blessing of our family. I have very young kids so I cannot really do fancy crafts with them, instead I print their hands on a Valentine card for their grandparents and relatives. I make a heart or a flower bouquet with their hand prints and it looks really cute. I usually bake a cake to celebrate that day. Nothing better than a sweet to enjoy this sweet day, right? For close friends and relatives I put together boxes with my soaps, lotions, and lip balms. Most of them live in PA so they really appreciate the lotion and lip balms at this freezing time of the year! Making homemade treats is my favourite approach to gift giving. Creating something special that is tailored to a person’s likes or taste adds an extra layer of meaningfulness to the gesture. 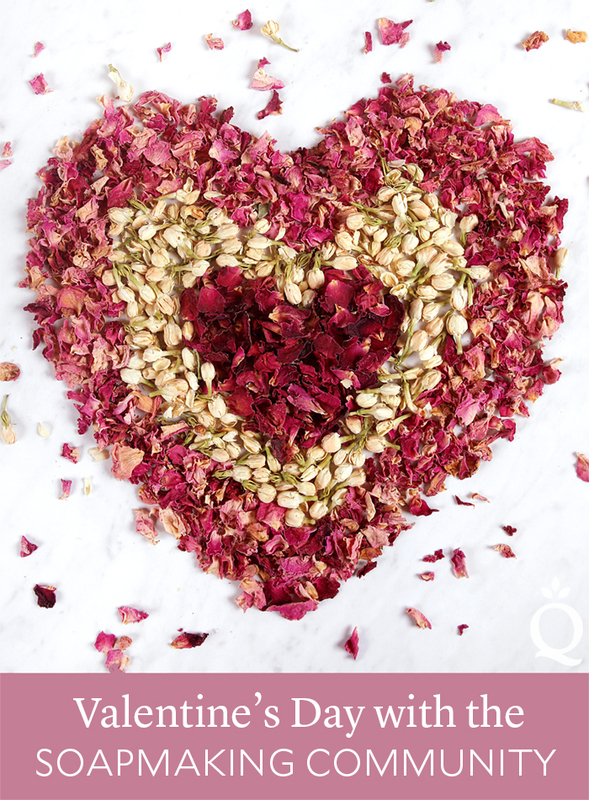 For Valentine’s Day, self-care and/or culinary treats make great gifts – something that people enjoy, but don’t always do or prepare for themselves. 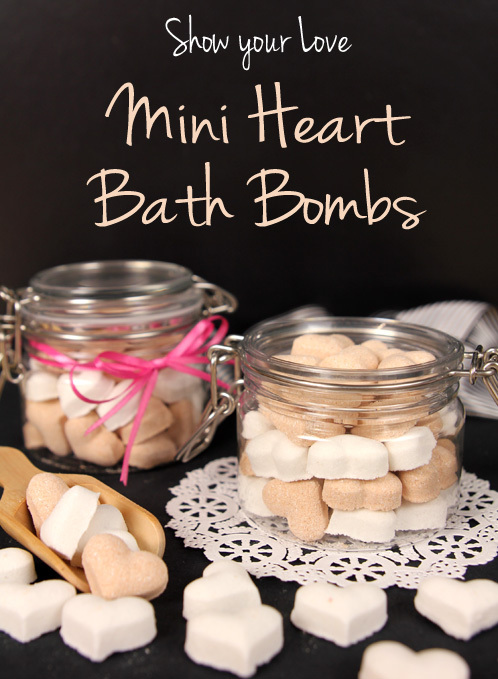 Creating homemade gifts need not be a costly undertaking either. Just use your imagination, and set aside the time – that’s what makes it so special. Simple Pleasures: What is your partner’s favourite morning ritual? Make a point of getting up early and surprising them with fresh tea/coffee/juice and/or breakfast in bed. Tip: grind coffee and do any other preparations in secret the night before to make your endeavours quicker and quieter the next morning. Sweet Treats: Chocolate dipped strawberries are so simple, yet so delicious. Pair them with home baked cookies or tiger butter (or better yet, both!) For Valentine’s Day, use a heart-shaped cutter to shape your cookies and to slice your tiger butter. 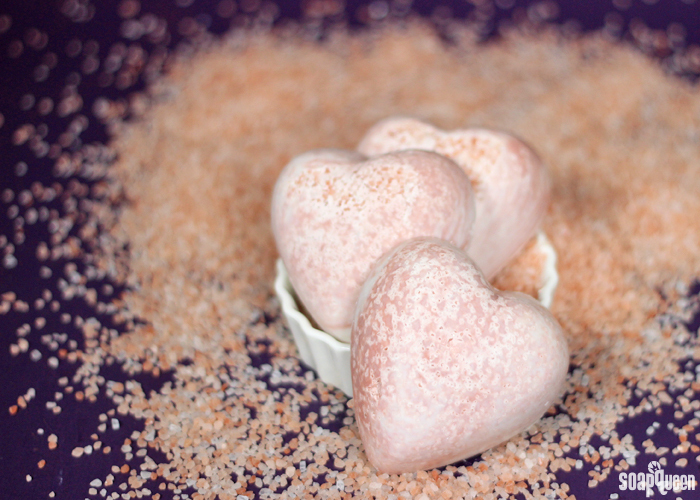 Bath Fizzies: What I love about bath fizzies is that most (if not all) of the base ingredients can be found in your pantry. Adding a floral scent to the mix is the perfect touch for Valentine’s Day. You can even use some dried lavender buds or rose petals for some added colour, texture and romance. 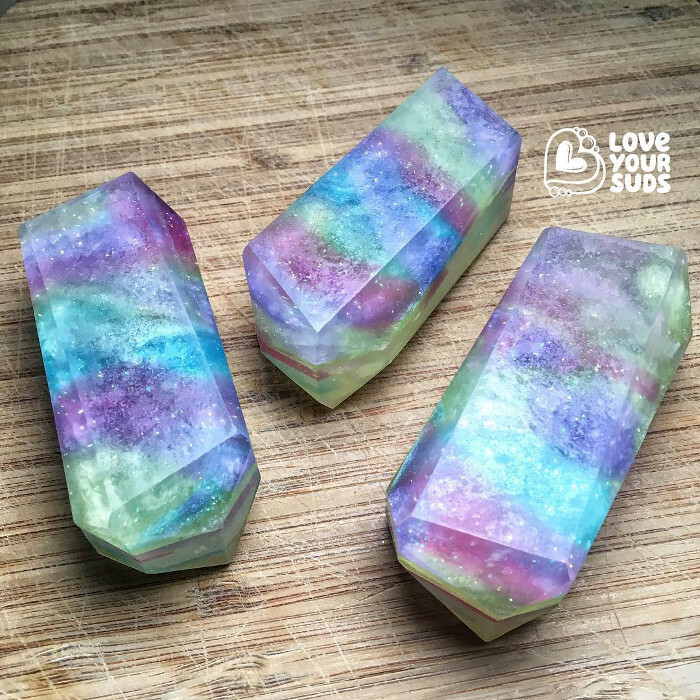 Personalized Gem Soaps: Cold process soap is where my heart is, but let’s face it, not everyone plans 4 to 6 weeks ahead to allow for the required cure time. When time is of the essence, melt and pour soap is the way to go; it is easy to use and your gifts are ready almost immediately after you pop them out of the mold. For Valentine’s Day start with the recipient’s favourite scent and choose a gem to match, or vice versa (e.g. lavender/amethyst/purple, rose/rose quartz/pink, peppermint/emerald/green, and so on). Another nice thing about melt and pour soap is that you can work with smaller batches, or make just one soap if you choose. The Rose Quartz Melt & Pour Tutorial is a great resource to get you started. 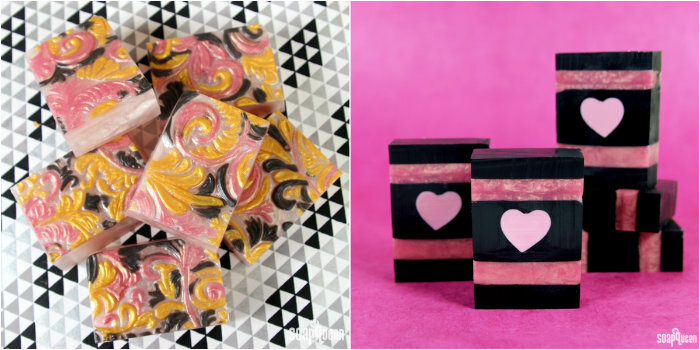 Beautiful gem soaps by Belinda. Tanya, Rough Cut Soap Co. I love to bake nearly as much as I love making soap, and making cakes and other treats for my family is a totally love-filled process. It’s also nice to surprise others with something delicious – for example I gave Viennese Fingers to my children’s teachers at the end of the Christmas term, as a little thank you for all their hard work. Sometimes, small, unexpected gifts are the most meaningful and make wonderful memories that last forever. When I started making soap to help my husband, I didn’t realize what an amazing and inexpensive gift handmade soap could be. We often have customers stop by the shop on their way home from work to surprise someone they love with a little something. 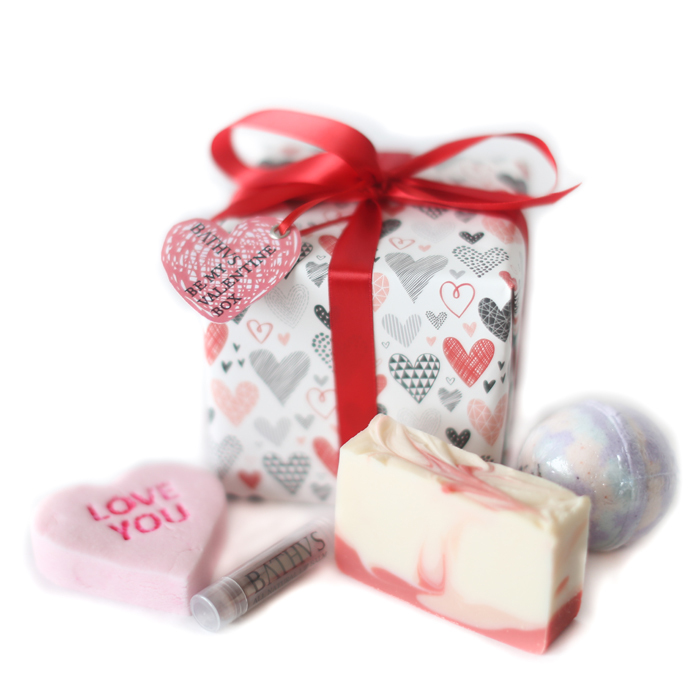 A nice soap and matching bath bomb tucked in a pretty box is always a fabulous gift. One couple tries to have lunch every day together. Even if it is only for 30 minutes, it gives them time to reconnect during the day. One gentleman comes in every week to buy his love bath bombs. It’s her “me time” and it makes her happy. A mom comes in once a month and treats her daughter, who is away at college, with her favorite soap. It’s something she loves and it reminds her of home. Every day, after I open my shop, my husband usually pops in with a coffee for me. This is just my favorite thing and makes me super happy. A small gesture that tells someone you are thinking about them doesn’t need to wait for a special occasion, a big holiday or be expensive. Pick out something they love and make an ordinary day an extra special day. 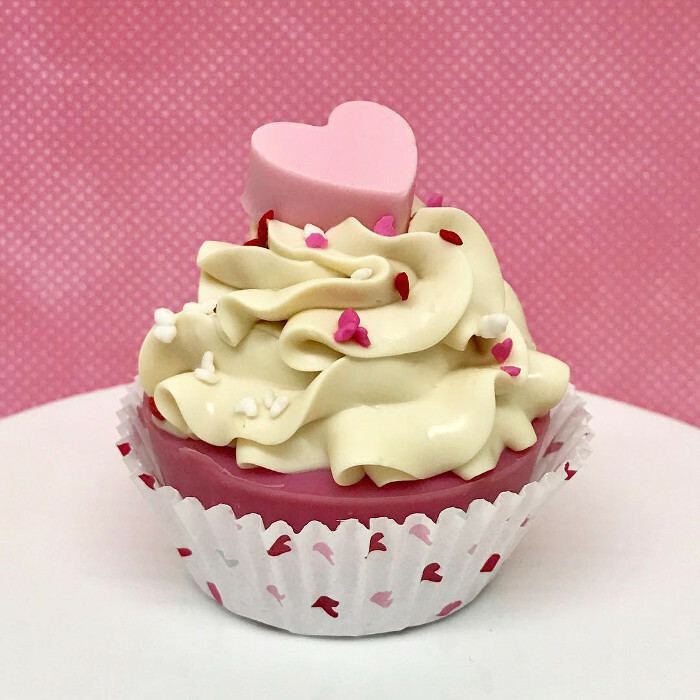 Sue’s adorable Soapy Valentine’s Cupcakes. Today, Shana of BΛTHVS is sharing her tips for creating a cohesive and thoughtful gift set. Shana is a pro when it comes to creating cohesive branding – take a look at her website and you’ll see what I mean! These gift sets would be perfect for Valentine’s Day, but Shana’s tips apply to every type of gift. If you’re a small business owner, Shana’s tips are great for putting together collections of products for customers. – A.M.
Hello! My name is Shana and I am the owner and creator of BΛTHVS. I started with cold process soapmaking and now make a bit of everything. I enjoy the packaging process almost as much as the making process. I typically favor clear packaging so that my customers know exactly what they are getting, but the gift boxes I make are the exception. Since the customer can’t see or smell the products within, I have to make sure that every detail is visually appealing and well put together. I’m here to show you how I put together a professional, creatively curated Valentine’s Day gift box! Perhaps you can take a few of my tricks and apply them to your products for your favorite gift-giving holidays or put a spin on your general everyday packaging! Proper curation is key when putting together anything that has a particular theme. Try to have a good idea of what you want to put together and the audience you want to please. For this Be My Valentine Gift Box, I am assuming that most recipients are going to be women and that this box would either be given to them by a partner, or by family and friends. Maybe someone would also purchase it for themselves in an act of self-pampering. Above on the left is a photo of the final selection and packaging of products for the gift box. On the right is each product and their individual product shots – they don’t necessarily look like they should go together on their own. I chose the more romantic of the pink, passionfruit scented Candy Heart Bubble Bars and set them aside for the boxes, and I also packaged the Cacao Lip Balm in a small glassine bag with XOXO themed washi tape to tie into the theme. To me, the Cacao Lip Balm sort of represents the classic Valentine’s Day box of chocolates, so it had to be included! I packaged the Passion Rose soap like my usual soaps, and I put some shrink wrap around the Wife of Bath Bomb so it would not leave any crumbs in the gift box! The gift wrap you choose is important, since it will be the first thing someone notices when they look at the box! I like to buy my paper from designers on Spoonflower.com. You can always find a design to fit your theme, and it is easy to reorder it when you run out! This is very important if you sell an item – if you buy your paper from a retail store, it’s unlikely that you will find it again! Shoutout to Caja Wong-Chung from caja_design on Spoonflower for her beautiful design! We got some pink and red crinkle paper to fill in the gaps and coordinate with our Valentine’s Day theme. It also helps keep everything nice and snug so that each product is protected – if you’ve ever worked with bubble bars, you know they can be a fragile craft, and we don’t want any broken hearts, both literally and figuratively! For the inside of the box I also throw in a business card and a detailed card stock list of what is inside with descriptions of each item. I like to also add pictures of our most photogenic items on this list. When selling in person it is useful to tuck a matching list under the ribbon on the outside of the box so that your gifter knows exactly what is in the box! Wrap up that box and put a ribbon on it! Don’t tie it yet though, because we need to make hang tags. I like hang tags that are nice and sturdy, so I chose heavyweight stock paper and print my label onto a sticker. I can just put the sticker directly onto the paper and cut it out. One side has the name of the box and my brand, the other side will be a nice pearlescent pink that can be written on! Instead of just punching a hole into the tag to run the ribbon through, I like to fasten metal eyelets into the tag—it just looks nicer and has a more professional look. Tie that tag into the ribbon on your box, make a pretty bow, and you’re done! 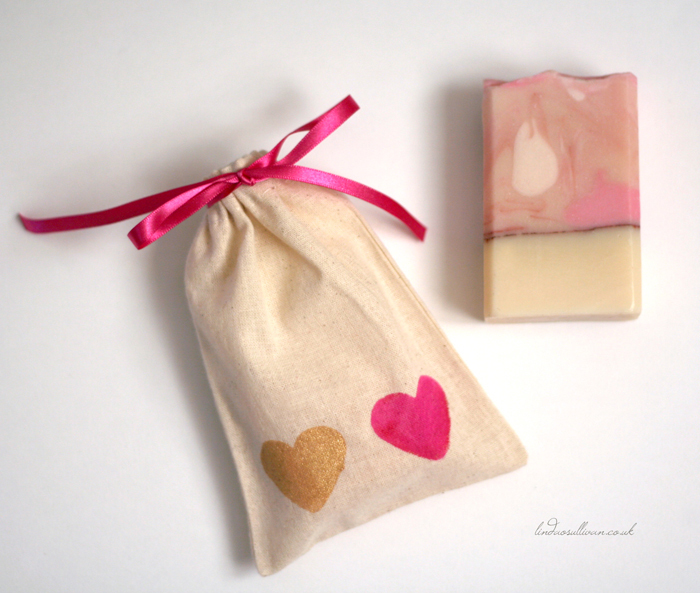 Today, Tania of Soapish demonstrates an adorable soap packaging option for Valentine’s Day. 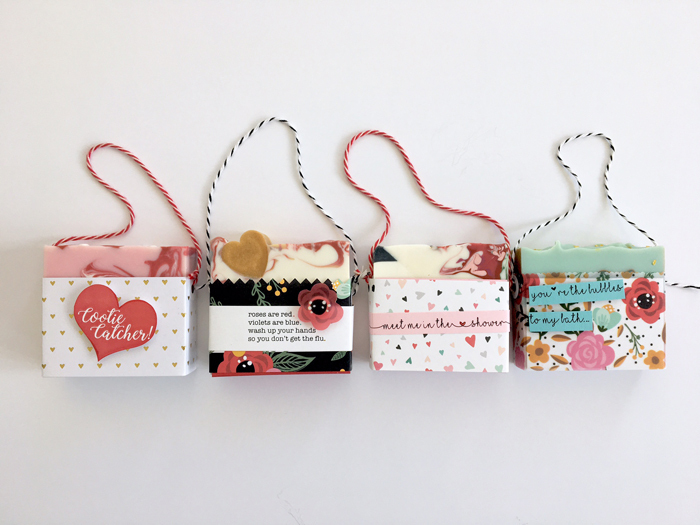 The project shows you how to create a hangable bar that’s a great way to gift your product or display it in a retail store. Tania really went the extra mile and included a free “Cootie Catcher” printable (Get it? Soap catches the cooties! Haven’t heard that term since about 6th grade #throwback), along with a video tutorial at the bottom of the post. Be sure to check out more Soapish videos here on Tania’s YouTube channel. – A.M.
Hello! I’m Tania, creator of Soapish in Los Angeles California. I just love Valentine’s Day! Not only is it my wedding anniversary, it’s a great occasion to gift bath and body products to everyone I care about! Part of the excitement of making my own products is coming up with creative ways to wrap and package everything. 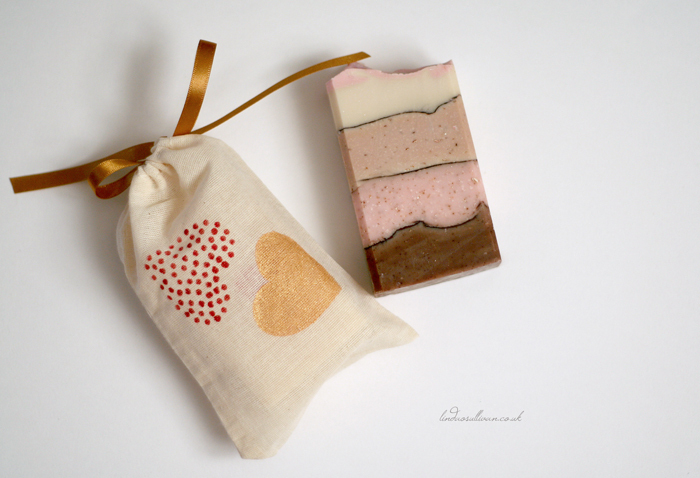 Today I’m going to demonstrate one fun way to wrap soaps for gifting. It has quite a few steps, but once you make one, you’ll see that its a pretty simple process with awesome results. Let’s get started! 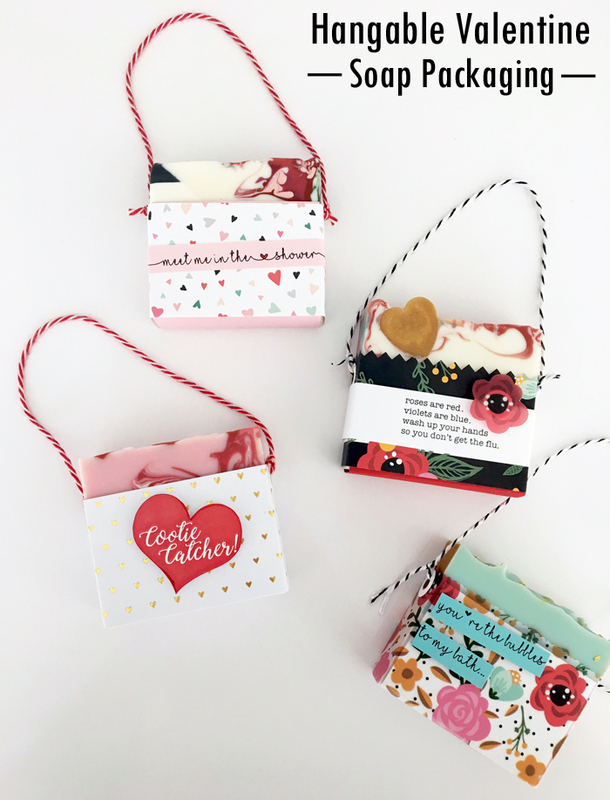 This week, some of my favorite soapers are demonstrating unique and creative packaging ideas with Valentine’s Day flair. How a product is packaged can completely change the look and feel, and is especially important for soapers selling their products. Today, the amazingly creative Linda O’Sullivan is demonstrating a cute technique for dressing up muslin bags. I love how this technique can be customized in so many different ways! -A.M.
Hi, I’m Linda, the soapmaker behind the Linda O’Sullivan website and the Instagram account mimi_and_boo. 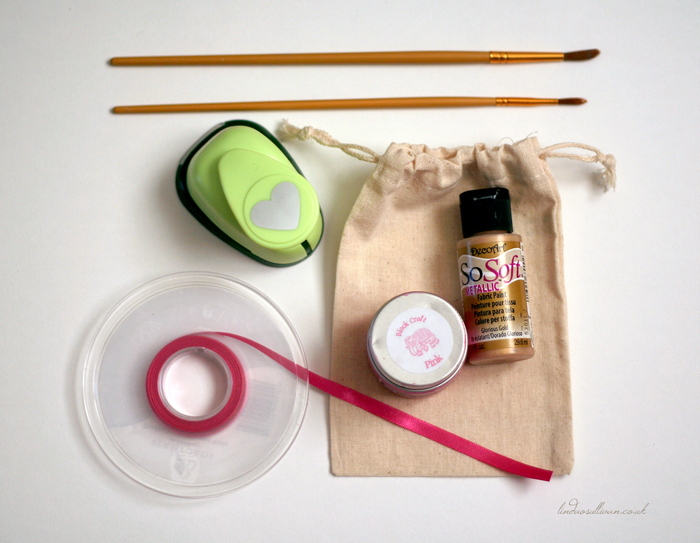 Today I am going to show you how to embellish muslin bags with fabric paint using a DIY custom-made stencil. I tend to use two types of packaging for my soaps. Mostly I wrap them with pretty paper dressed with colorful ribbons. However, if I am selling at a market, I like to keep things simple by popping each soap into a muslin bag. I like the muslin bag solution for various reasons. The soap is totally protected, the packaging is minimal and re-usable – so no plastic, no wastage. And last but not least, it’s a very easy option because all you have to do is pop your soap in the bag, attach a label and you’re done! Muslin bags are very versatile. They are like a blank canvas – you can keep things simple by just stamping them with your logo or design or you can decorate them in various other ways. I like stamping them but sometimes I prefer the brighter, more vibrant colors you can get with fabric paint. As Valentine’s Day is just around the corner, it seemed fitting to choose a Valentine’s Day theme for this project, so let’s get started. 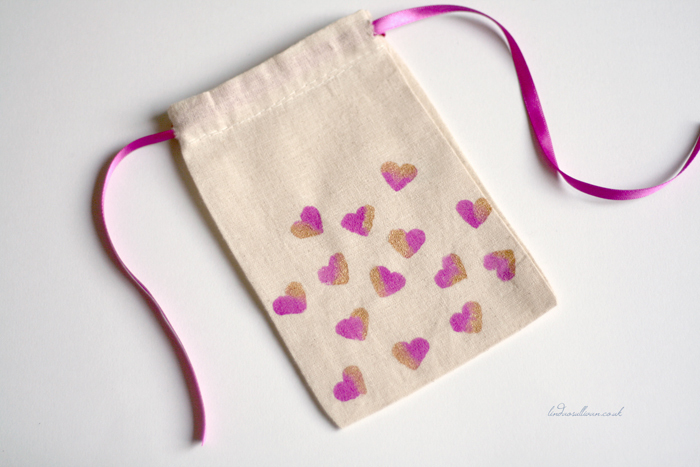 For this design, we are going to paint random little hearts all over the bag. To start, insert a piece of card in your muslin bag. This is so the paint does not bleed through to the back of the bag. Next, we are going to make our own ‘stencils’ using freezer paper. If you are good at drawing and using a craft knife, you could do it that way. I’m not, so I tend to stick to simple, easy designs! I cut up a few small rectangular bits of freezer paper and used a heart paper puncher to punch a little heart in each bit of paper. You want your bits of paper to be big enough so that there is some space left around the punched out heart. That blank space is important because it is the bit that will stick to the bag, thus creating your stencil. 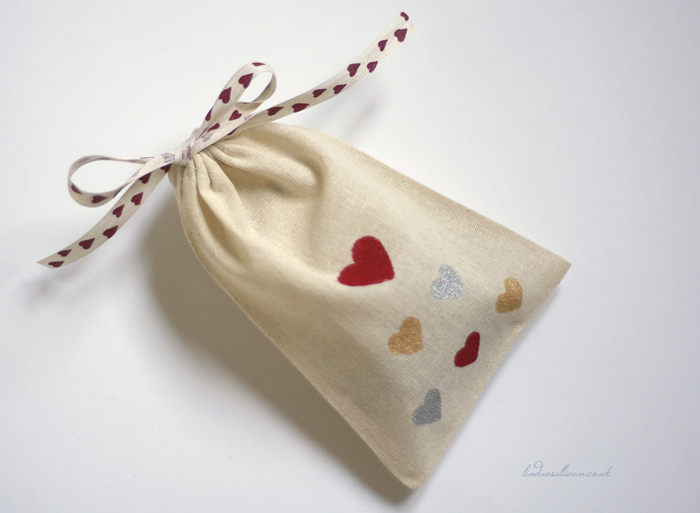 Place your heart ‘stencils’ shiny side down all over the muslin bag, making sure that the heart shapes do not overlap. Next switch your iron to medium and carefully but gently press over the freezer paper until the heat of the iron makes the shiny side of the freezer paper stick to the muslin bag. You may find it easier to do a couple first, iron over them, then do the next couple and so on. 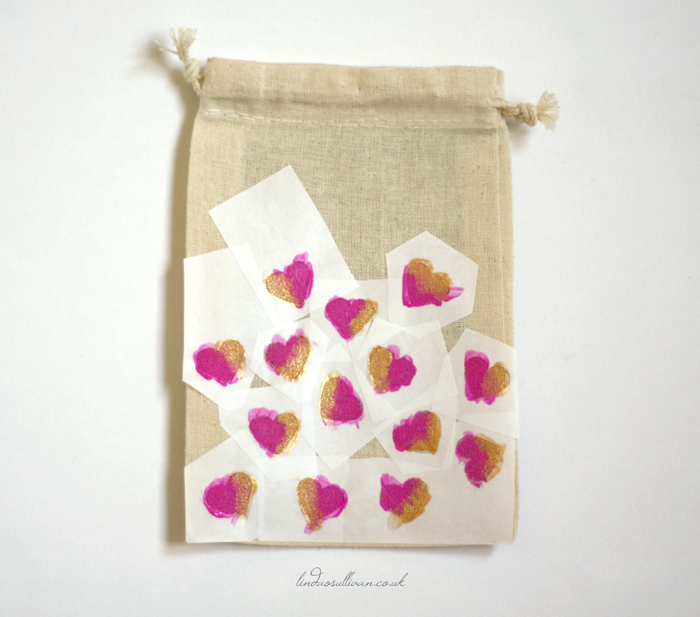 When your stencils are fixed to the bag, use a small brush to dab fabric paint onto your heart stencils. When you’re done, slowly remove the stencil and allow the paint to dry. Once the paint is dry, you can remove the scrap of cardboard from the bag. 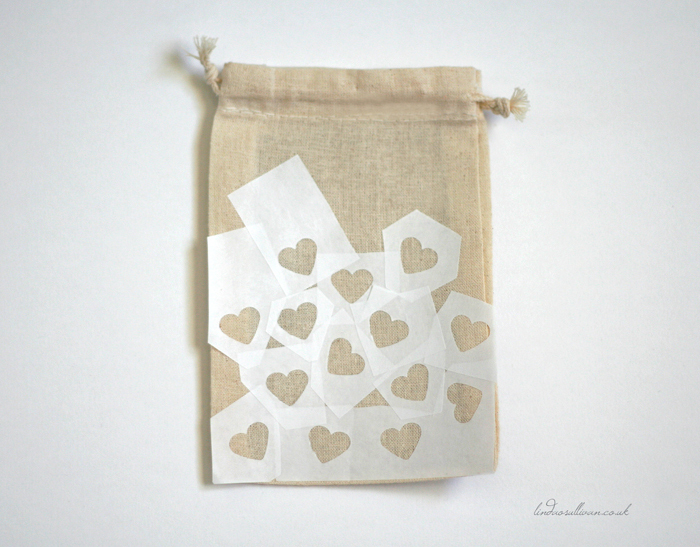 Below are further examples of how I decorated my muslin bags. Tip: If you want to do a simpler design, such as just one big heart in the middle, you can make several stencils in one go by placing several pieces of freezer on top of each other. I was able to do 5 in one go with no trouble at all. Valentine’s Day is one of my favorite holidays. It’s a great time to express your love for the people in your life, be sappy and say the things that we don’t always say in everyday life. I like to spoil my friends and family with small handmade gifts on Valentine’s Day. Who doesn’t enjoy receiving a gift covered in hearts? 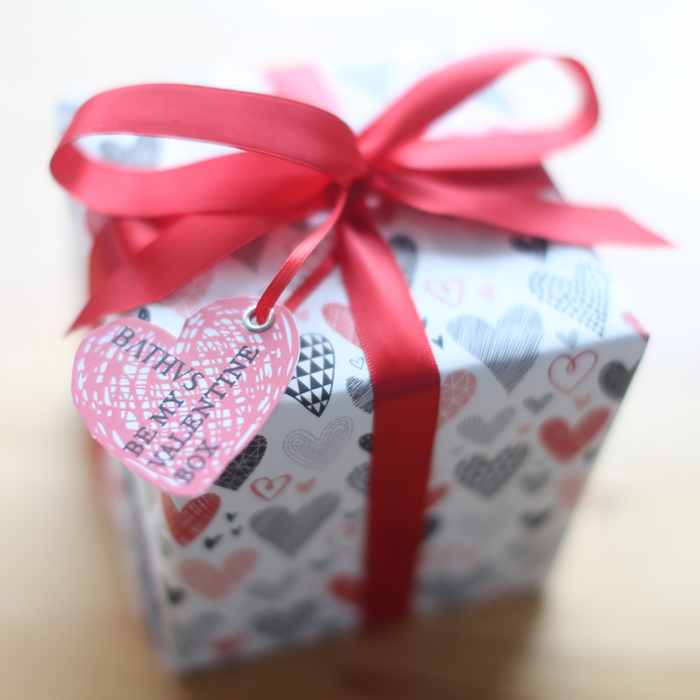 In addition, who doesn’t love making gifts covered in hearts? It’s a win win! With Valentine’s Day just a few weeks away, now is the time to get crafting. Melt and pour is an awesome crafting option when you’re in a time crunch, because the soap does not require any cure time. 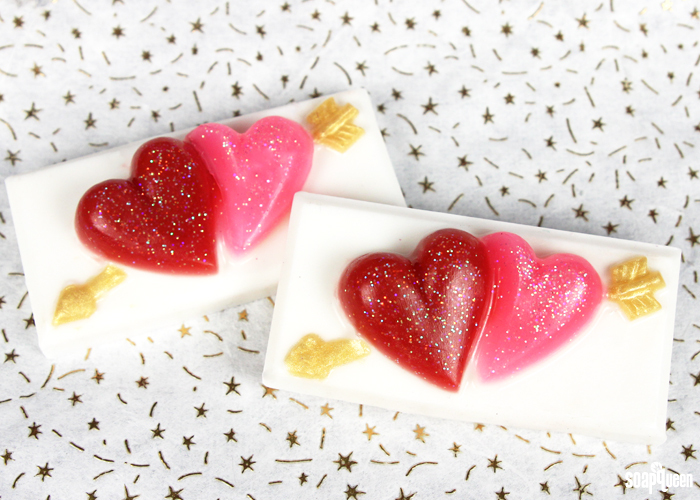 These cute Sparkling Strawberry Melt and Pour Bars feature pink and red hearts, scented with a combination of Strawberry and Champagne Fragrance Oil. 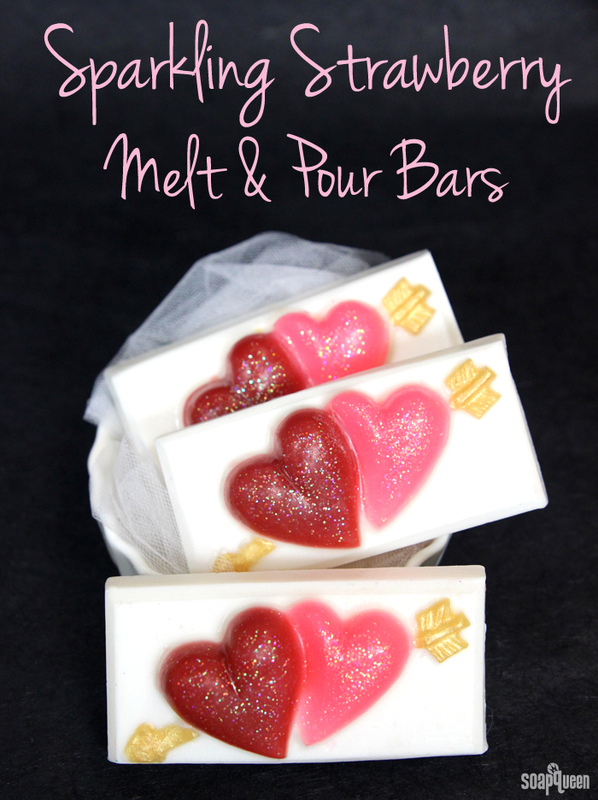 These Sparkling Strawberry Melt and Pour Bars smell sweet and bubbly. Rose gold has become super trendy in the past few years. It translates beautifully in melt and pour soap with the use of Rose Gold Mica. In both the Romantic Rose Gold Melt and Pour Bars and the Rose Gold & Charcoal Heart Melt and Pour Bars, Rose Gold Mica creates a warm pink hue. The Romantic Rose Gold Melt and Pour Bars are scented with Baby Rose Fragrance Oil for a traditional Valentine’s scent. In contrast, the Rose Gold & Charcoal Heart Melt and Pour Bars use White Magnolia Fragrance Oil which has a soft and feminine scent. 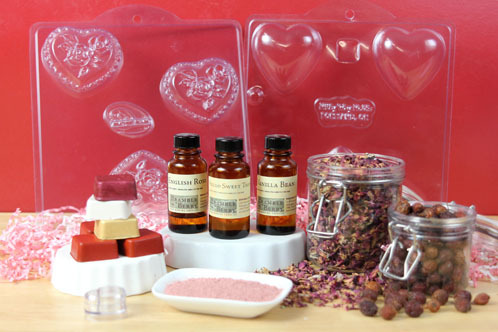 With Valentine’s Day quickly approaching, now is the time to start creating gifts for your loved ones. Handwritten valentines are an excellent way to show love and appreciation; I’m a firm believer in the power of a well written card! 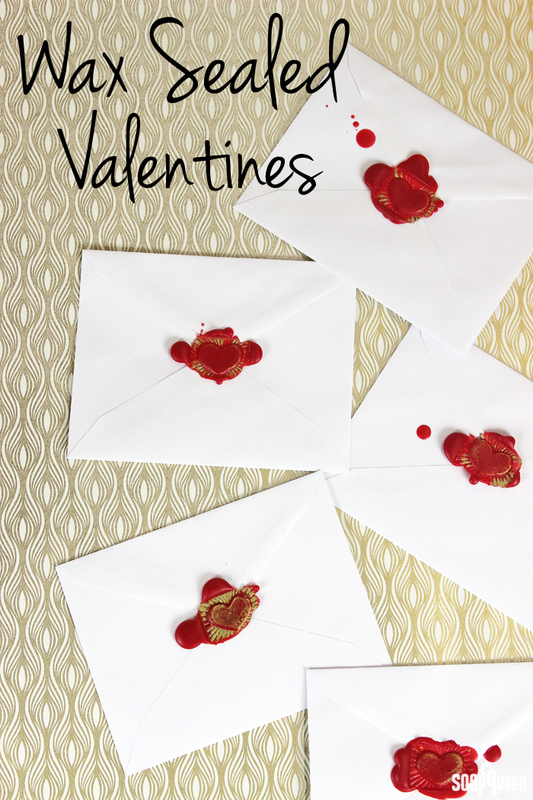 This year, make your love note one to remember with a dramatic wax seal. Sealant wax is commonly comprised of beeswax and resin to create an incredibly hard, sticky wax. 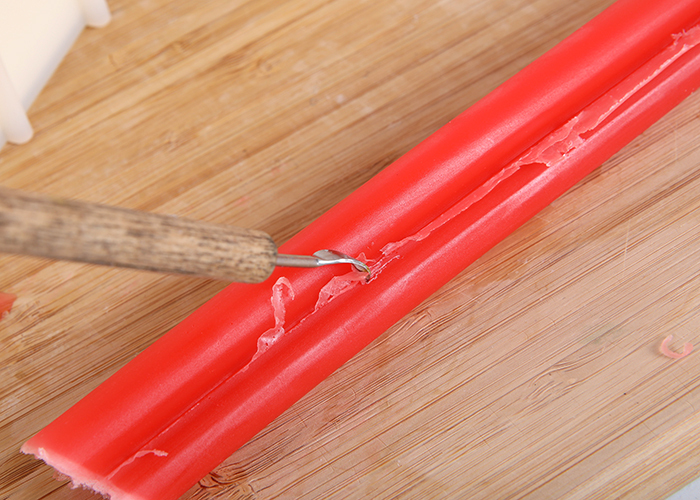 Without resin, this combination of waxes is not as hard and brittle as traditional sealant wax, but it’s perfect for adding a decorative touch to your letters. 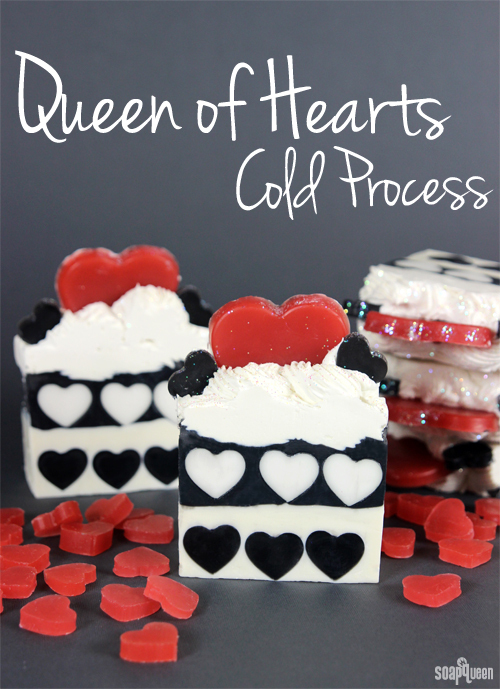 Inspired by the regal character from Alice in Wonderland, this Queen of Hearts Cold Process soap is full of eye-catching contrast. 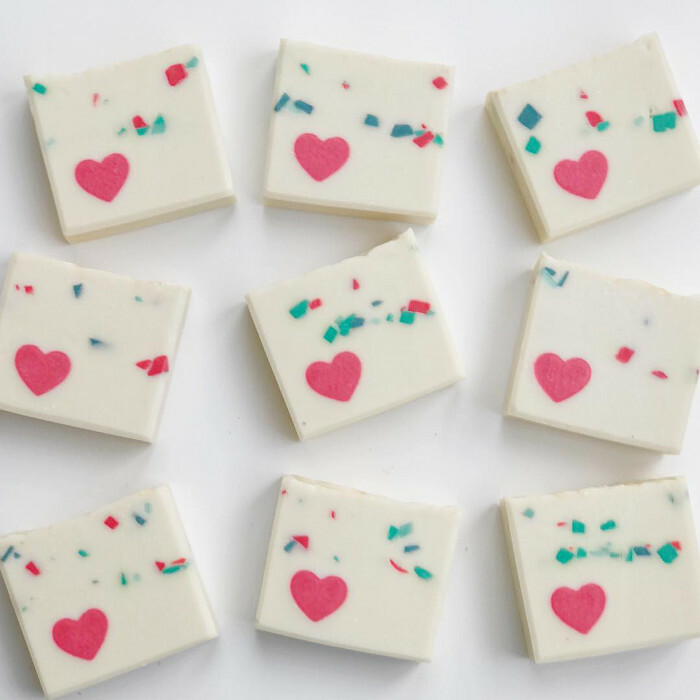 Created with melt and pour embeds, a cold process base and soap frosting, this sophisticated soap will make a fantastic Valentine’s gift (it will be here sooner than you think!). 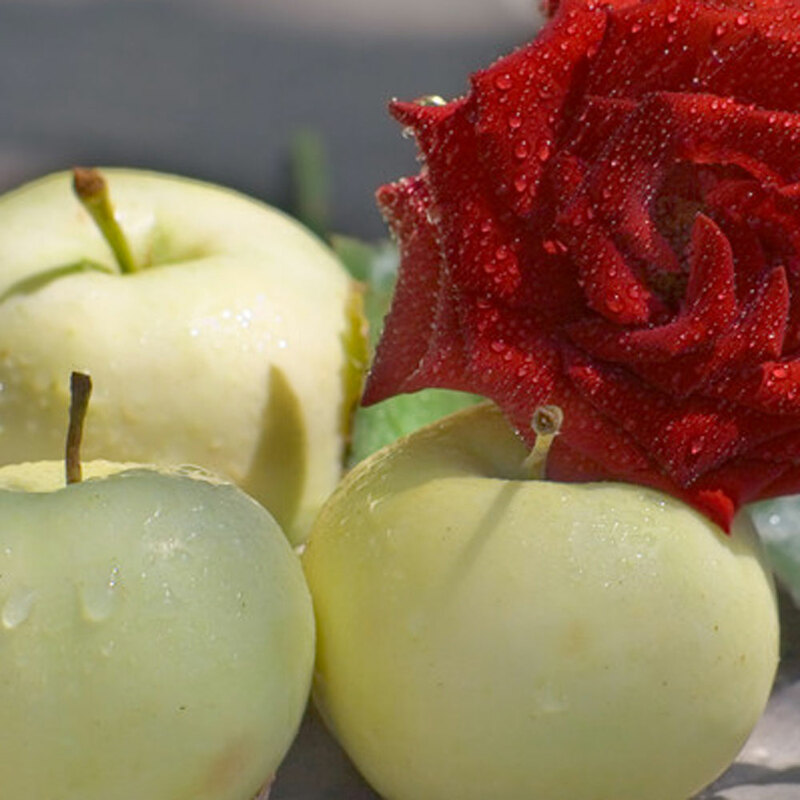 LoveSpell and Baby Rose fragrance oils create a rosy, warm and slightly juicy scent blend that is wonderfully feminine. 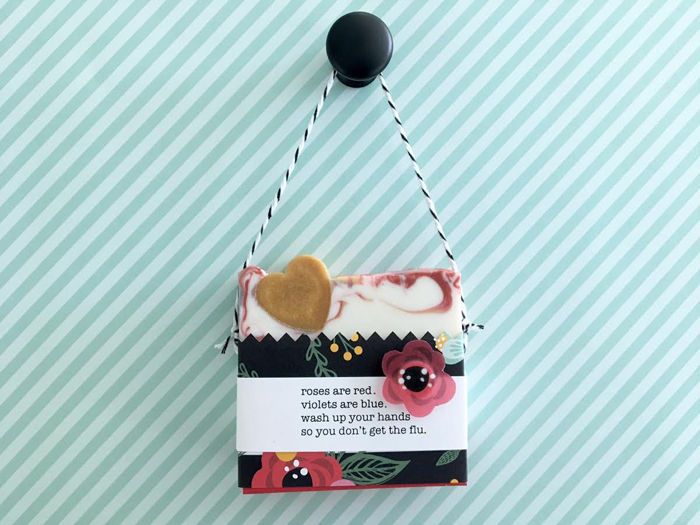 Aside from actually making the products, one of the best parts of crafting is creating fun packaging to enhance your soaps, bath bombs or scrubs. 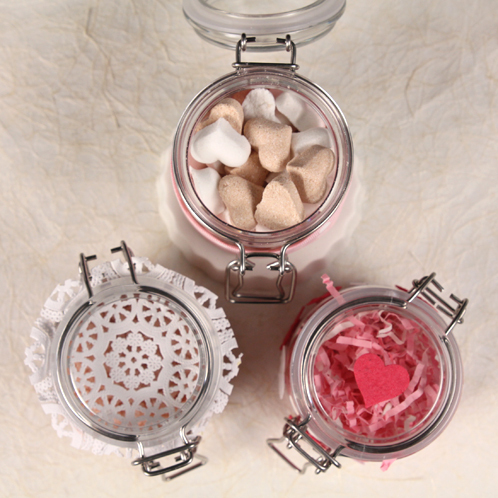 As part of Show Your Love, we’re giving you a few simple ways to jazz up the bail jars that make great containers for the Mini Heart Bath Bombs or the Pink Sea Salt Foot Scrub (tutorial coming soon on the blog!). This Valentine’s Day, skip the chocolates and the roses in favor of some handcrafted goodies. From now until February 5, we’re rolling out several special tutorials and discounts as part of Show Your Love, our special treat for you and your special someone. Keep your eye on the blog and subscribe to our newsletter to be first in the know about special deals, discounts and lovely soapy tutorials! Even though we’re only halfway through December, it’s never too early to start planning for special handcrafted treats you have in mind for Valentine’s Day. This is especially true when making cold process soap, which takes up to 6 weeks to fully cure. The frigid weather can also delay packages and lengthen transit times. Plan ahead to ensure you receive your items with plenty of time to create your perfect gift. It’s cold outside so there is no better time to cozy up in front of the fireplace and plan how you will share the love for Valentine’s Day than right now! Pictured above from left to right : Color Blocks for Melt and Pour in Non Bleeding Perfect Red, Shimmer Light Gold, Shimmer Super Pearly White, and Shimmer Merlot Sparkle. Fragrance Oils; English Rose, Hello Sweet Thang, and Vanilla Bean. In jars, Rose Petals and Buds and Rose Hips. In front, Rose Clay and Heart Lip Butter Pot. Molds in the back, Heart with Rose Mold and Simple Heart Mold.